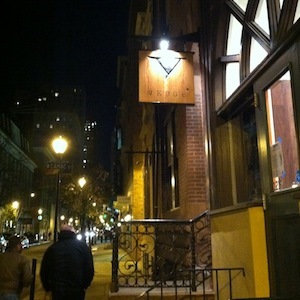 hey everyone, today we’ve got a field report by my good friend kevin mudrick all about the newly opened vedge restaurant in philly. 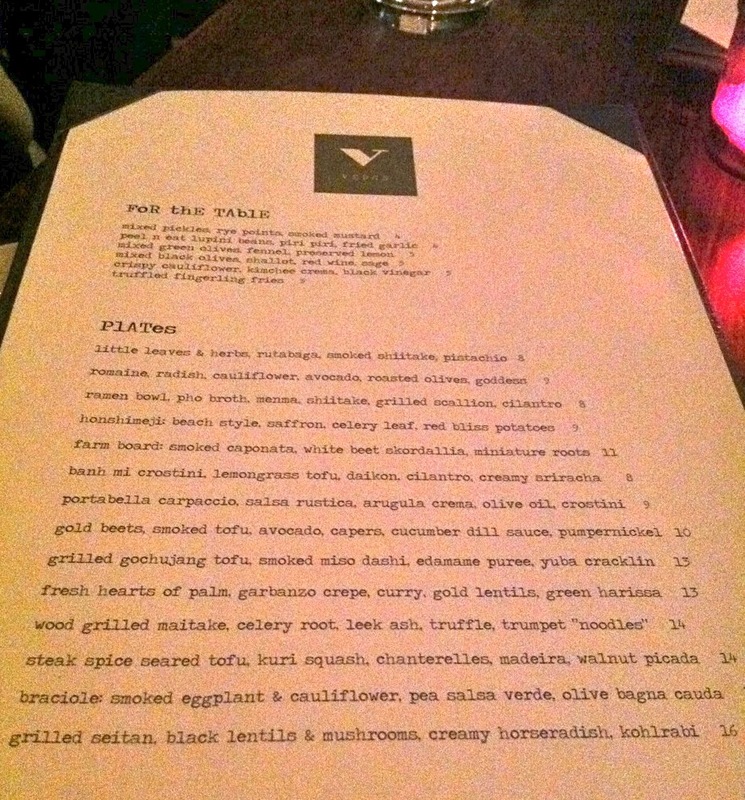 the upscale establishment is all vegan and offers the kind of fine dining that makes me wanna take a trip east just to eat there. for more kevin, check out vegan brew. From the outside – a short block and a half from the walnut-locust subway stop. Didn’t really get any interior shots but the place is beautiful – lots of very nice wood on the walls, etc. The bar is magnificent and fancy-looking. 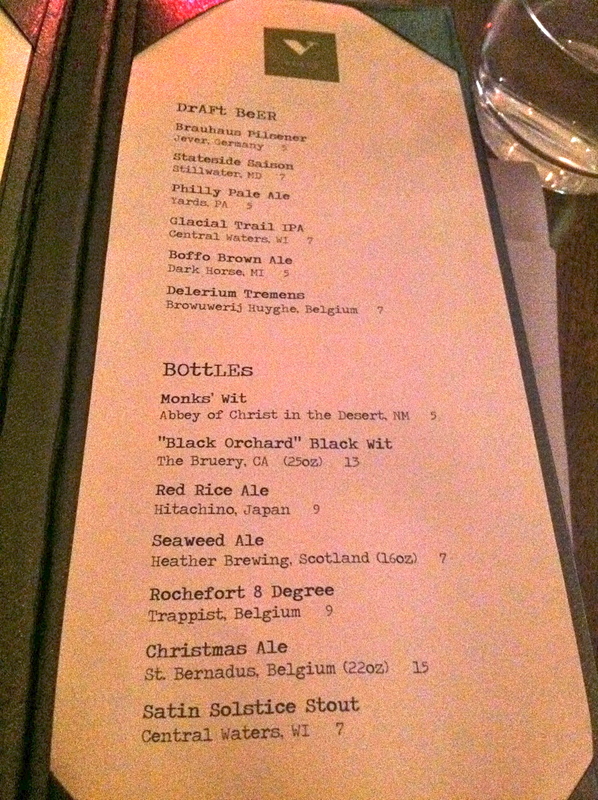 The beer list is much improved over the old Horizons. Nice mix of local & belgian stuff – Rochefort 8 for instance is arguably one of the best belgian strong dark ales in the world! We chose to skip alcohol tonight as the Philly Marathon is this weekend. I didn’t take a picture of the “drinks” because I don’t really care about them. 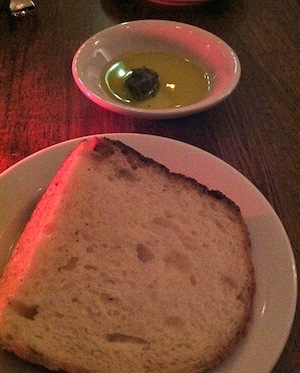 Complimentary bread & spicy olive oil with a pesto. Good, though I wish the bread was warm. 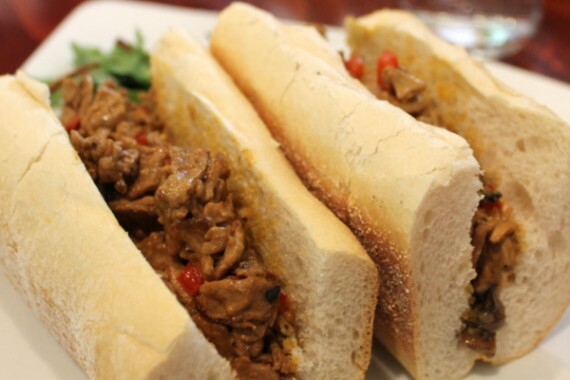 if i could only eat one meal out in philadelphia, you can bet your arse it would be a vegan philly cheesesteak. 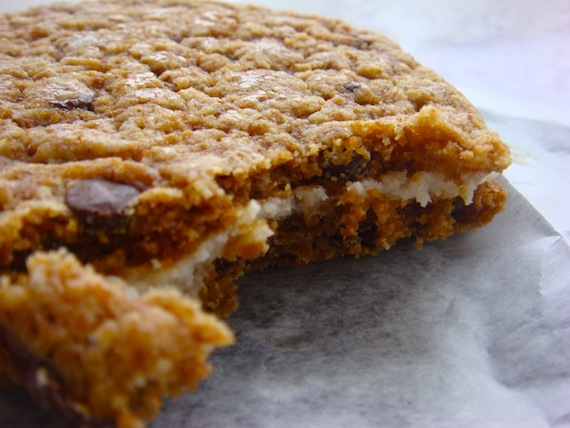 thankfully, JL goes vegan is the same and she’s written us a lovely field report on the coveted sandwich. i really wanna go to philly so bad someday, and when i do, this thing is on my bucket list. I recently found myself on an Amtrak from New York to Philadelphia to attend a cooking intensive. The great thing about taking a three-day vegan culinary class is that you don’t worry about where to eat — you eat what you cook. I arrived Friday morning, the class was to begin at 2:30, so I had only one meal out. I met up with my friend who lived locally. She knew I wanted a vegan Philly cheesesteak sandwich for lunch and suggested Mi Lah. 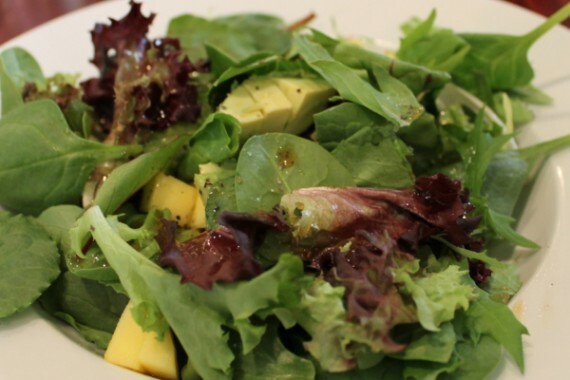 This small, vegan restaurant is bright and bustling. As I read the menu I became quickly distracted by the specials of the day (from rice noodles to veggie burritos to mofongo veggie bacon and chorizo to corn masa cakes) and had to snap myself back to my mission: eat a vegan Philly cheesesteak! This was the “small” salad. The portion was generous and the fruit and vegetables were extremely fresh. Living in South Philly for the past decade, I don’t know how I didn’t check out Circles sooner – even though several people I know have raved about it. It took a “Hey, wanna check out Circles tonight?” text from one of my friends yesterday to finally get over there. Circles has been around for a few years for takeout & delivery, but only recently opened up a “dining” room restaurant extension. It’s not really an extension so much as another building across the street, where food gets shuffled back and forth over a small, slightly-larger-than-an-alley South Philly street. I love Thai food, but I’m always suspicious of places that are overly vegan-friendly – I hate playing a game of 20 questions (fish sauce? shrimp? oysters? etc) which has been my experience. Circles clearly marks everything on their menu that is vegan, and most of the menu is able to be made vegan. Yay! 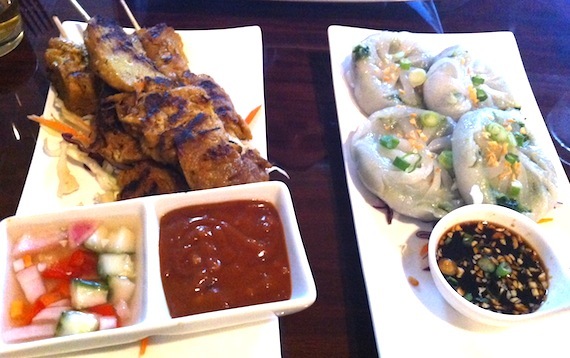 Seitan satay, which are yummy grilled thin strips of seitan on skewers served with a peanut sauce. Awesome! And Pan Fried Dumplings, which had a nice spicy kick to them. 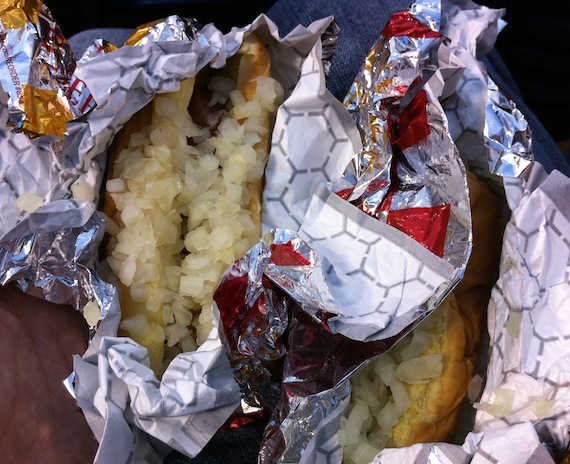 a couple years ago, we blogged about the surprisingly vegan-friendly food at LA’s very own dodger stadium. now in 2011, we’re happy to report that ball parks across the country are stocking more and more meatless options. today kevin of vegan brew sent us some pix of his vegan visit to a phillies game, and we were just blown away by the amount of options! we’ll show ’em to you in this edition of quick bites.